Anyone else craving some wholesome goodness? 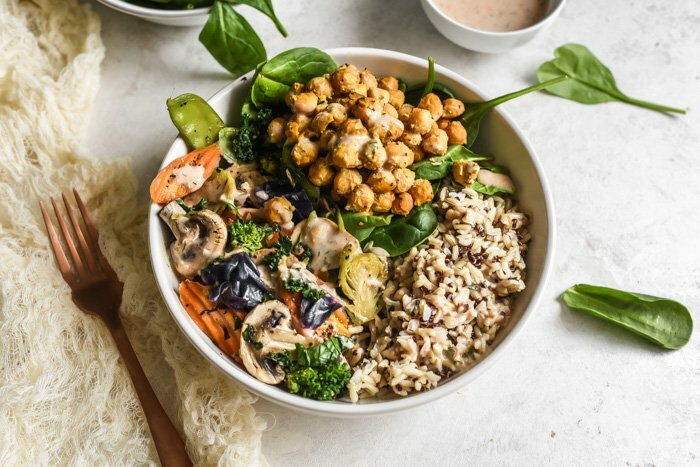 I’ve been so inspired recently by all of the pretty and healthy bowls that everyone has been making. All of the modern, hip food bloggers are doing them. 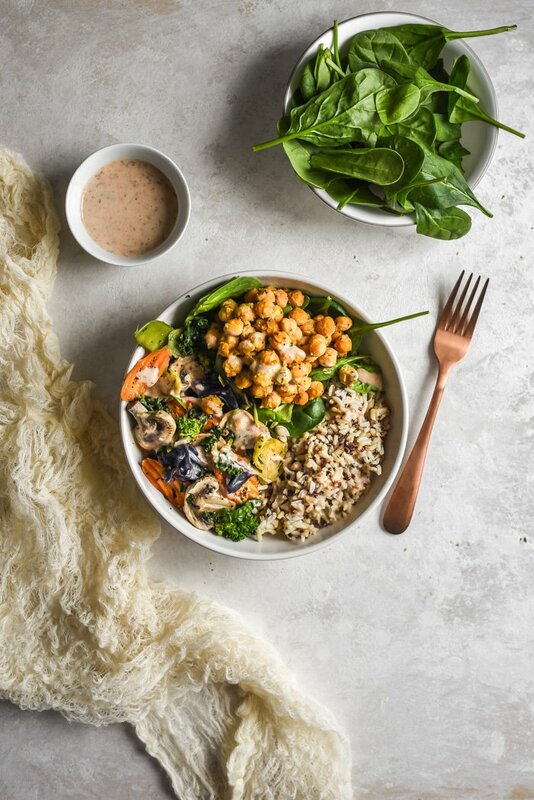 There are a bunch of different names for them; buddha bowls, nourish bowls, quinoa bowls, there’s even the smoothie bowls going on. Basically, everything is in bowls and if it’s not then you aren’t doing it right. My main goal for this recipe was to keep things really simple and I even took some optional short-cuts/cheats for my own bowls. 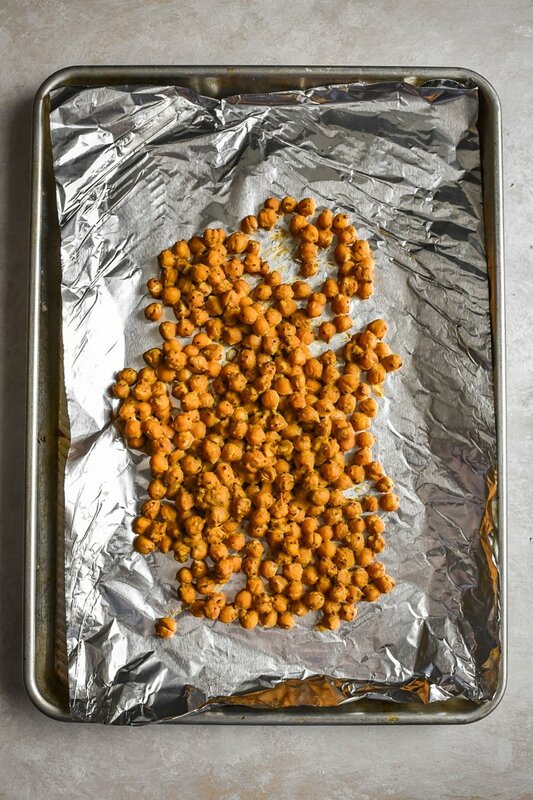 The first step is to make the “parm” chickpeas which are way easier to make than you might think. It’s a simple combination of nutritional yeast, garlic powder, and salt and pepper to your taste. Then you roast them until crispy and your all done. The aji ranch is definitely something I’ll be repeating. Aji is like the standard hot pepper that I became familiar with when we lived in Chile. It may not be the easiest thing to find depending on where you live but it can be easily replaced with another hot pepper sauce like sriracha or any that you like. 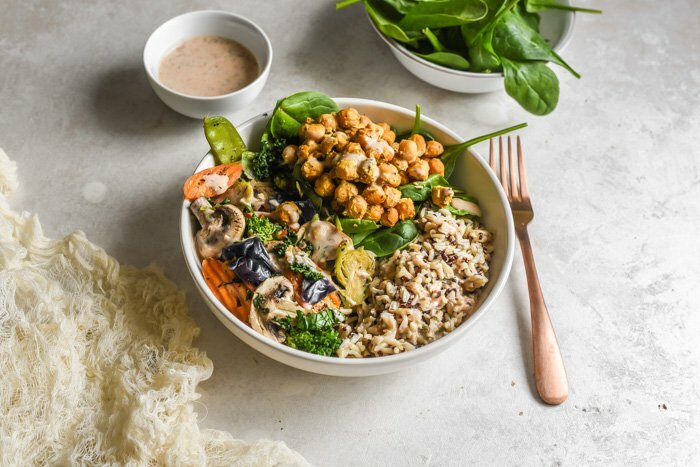 It takes all of 2 minutes to stir together and is the perfect flavor compliment to these bowls. As for the “grain” in this recipe I was going to do quinoa until I realized I was almost out of it, hence the fact that I cheated a little. I used some of those ready to eat rice packets that you can get at most grocery stores. The one I used was brown rice and quinoa, however, you can use plain brown or white rice, couscous, barley, or quinoa. Basically any grain that you prefer. Although, if you want them to be gluten free then go with whatever gluten free grain you like obviously. These are super adaptable so make them your own. Lastly, for the veggies I cheated again. I used a pre-mixed bag of stir-fry vegetables that had broccoli, brussels sprouts, carrots, snow peas, kale, red cabbage, and mushrooms. I steamed them with only the most basic seasoning and added them to the bowls. If you haven’t caught on to this by now, I’m trying to relay that these bowls are completely customizable. Let me know what you think and what changes you make to your recipe because I’d love to hear. Simple meals are the best and the easier the better. These bowls are perfect combination of a few really easy components. Stir together the ingredients for the ranch and set aside until ready to make up the bowls. Pour veggies into a large skillet and add about 1/2 an inch of water. Cover with a lid a place over medium high heat to steam for 6- to 8 minutes or until they reach your desired tenderness. Remove from heat and season with garlic powder and salt and pepper to taste. 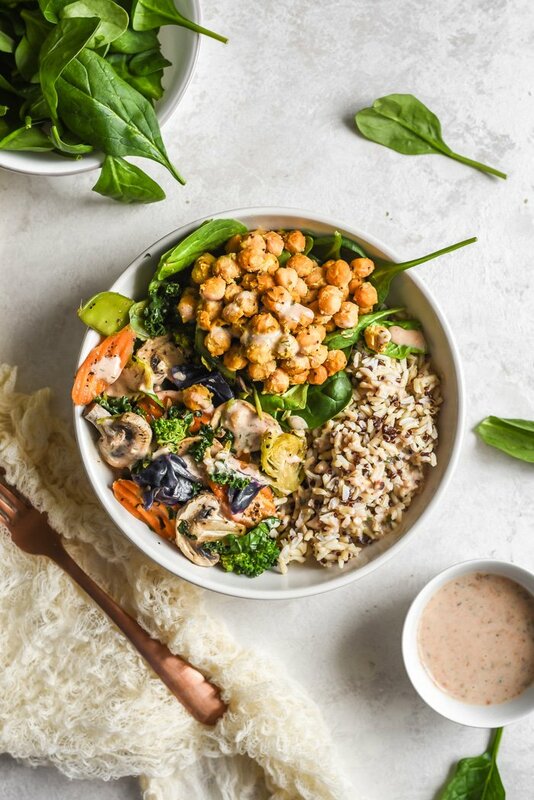 To make the bowls warm your chosen grain (if not already hot) and scoop desired amounts into bowls along with the steamed veggies, fresh spinach, and roasted chickpeas. 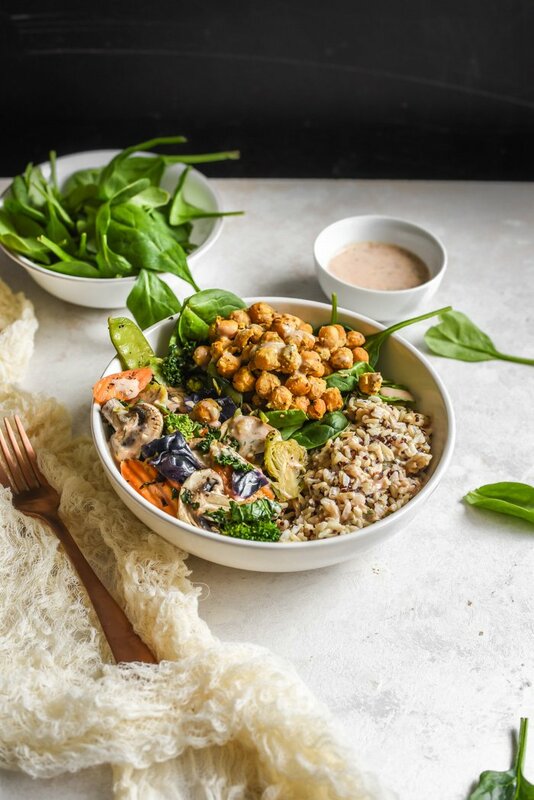 Drizzle aji ranch over bowls as desired or serve along side. ALL CONTENT IS MINE AND ORIGINAL! All of these food photos were taken with my Nikon D750 and my favorite Lens, the Nikon AF-S FX NIKKOR 50mm f/1.8G. You can find out more in my INTRO POST. Also, a huge shoutout to @rigaronib for designing my logo! If you're looking for more recipes check out some of my other recent posts!